Probably for childrens festival 7-5-3. These lanterns were put up for the special 50th year anniversary of the rebuilding of Meiji Shrine and the Annual Meiji Shrine Autumn Festival (Oct. 31 to Nov. 03). Sadly I didn’t know about it and I missed it even though I saw some of the lanterns outside the shrine on Omotesando while I was having dinner nearby on Sunday night. Thank you Taro - I asked around but nobody could tell me why the lanterns were there. My crappy keitai photo doesn’t do justice to the impressive display that it is. I loved the changing colored lights in the background. 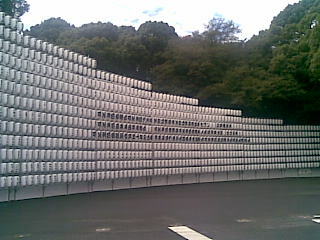 It was a huge wall of them and all sponsored by Omotesando businesses, it looked like.